Joe DiMaggio's fabled 1941 hitting streak is a feat widely and properly considered one of the greatest in the history of American sports. It has long been believed that the legendary center fielder used just three bats to construct his extraordinary streak of fifty-six games, and that only one has been identified from that trio. 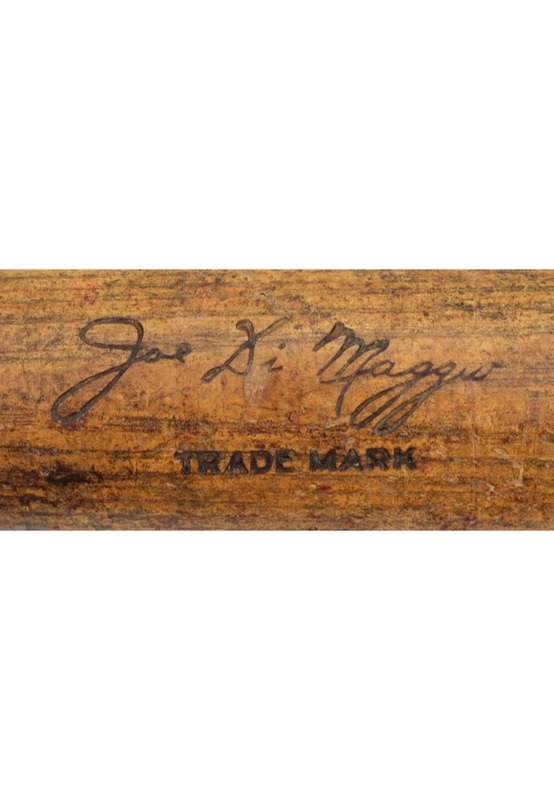 Close inspection of the center brand of that Museum bat finds a stamping abnormality resulting in a very faint number "1" in the "125" numeral, and a downward bias of "125," a flaw identified as having appeared only in one of the three DiMaggio orders for bats made on 4/24/41, 7/1/41 or 7/3/41. 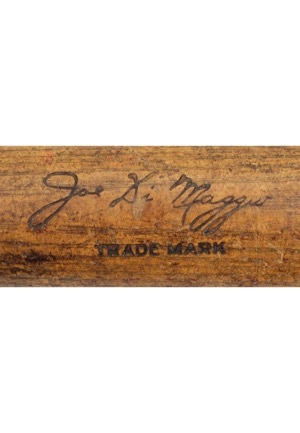 As such, we can be assured that this bat, bearing the same center brand abnormality, was in Joltin' Joe's possession during the streak. The thirty-six inch Rudy York (Y4) model weighs thirty-five and a half ounces, the latter stamped into the knob, consistent with ordering records. 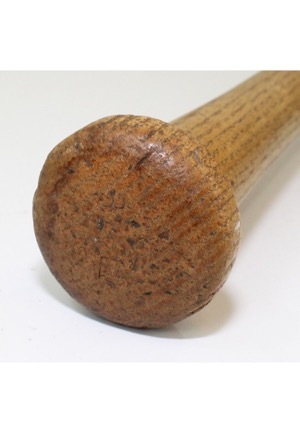 Thus we can identify this bat as one of twelve or thirteen such bats that were delivered in these three Streak-era orders. 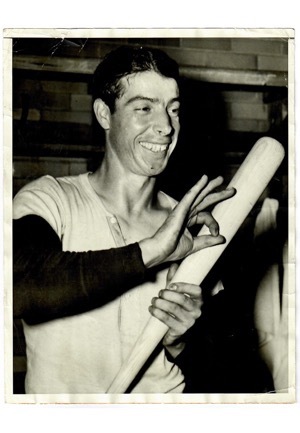 DiMaggio was quoted saying, "I could order a dozen bats. They would all look alike, same size, same weight. But there's always one that feels different. That's the one I'd work on. I would dip it in olive oil. I'd sprinkle it with resin. I'd put a small flame to it. And when it was good and dry, I'd file it down with sandpaper. It would be hard and smooth and black. 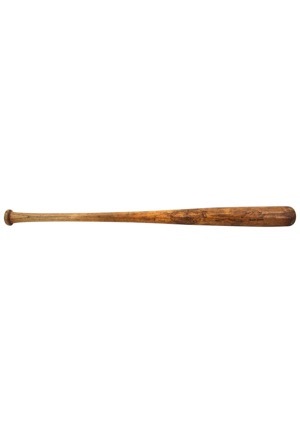 This was my bread and butter bat." Analysis utilizing infrared spectroscopy found clear evidence of chemical compounds consistent with heated oil and resin, and parallel scratches consistent with DiMaggio's stated practice of a sandpaper finish. These black marks are particularly evident at the point of ball strikes, which appear with plenitude on the left, right and back barrel. 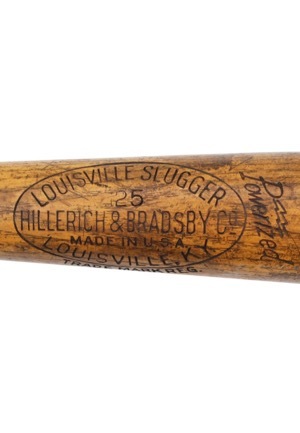 A degree of post-player use is likewise evident, not uncommon for pre-war bats. 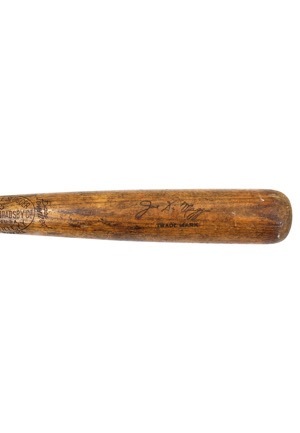 It's an elite treasure simply as a memento of DiMaggio's immortal MVP and World Championship season of 1941, and a true hobby grail as a likely participant in the greatest hit streak ever constructed. 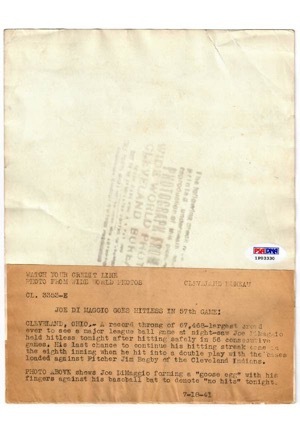 Accompanied by a LOA from PSA/DNA grading this tremendous offering a GU7 as well as an additional LOA noting a possible match to the included wire photo dated 7/18/41, the day the streak ended. Also accompanied by a 21 page report from Anderson Materials Evaluation Inc. which evaluated the bat via FTIR and optical microscopy analysis.